Why have 15 Twitter accounts? It’s all about giving your readers what they want. Do you enjoy reading a stranger’s tweets about his/her health? I don’t, really. But I do enjoy reading the health tweets by my close friends and family. So strangers don’t have to read my tweets about chocolate cravings, I have separate those tweets into a dedicated twitter account called @mattshealth. How about baseball? Many people don’t want to read people’s tweets about baseball, so I put mine into a dedicated baseball account, @57hits. Certainly people don’t want to hear someone rant on about fantasy football, so I have a specific account for that, @flyingonions. My 15 twitter accounts are all about allowing the reader to select exactly what they want to see from me on twitter. My main twitter account, @mattmaldre stays a nice clean account without any tweets about my health. It is clean from any foursquare check-ins, baseball tweets, football tweets. How do I manage 15 twitter accounts? It’s really easy with hootsuite. Super-easy. I really recommend any twitter user setting up separate twitter accounts. It makes things really nice for your followers. When people get to know me, they soon find out that I have multiple twitter accounts. But most people don’t know which ones to follow. Below is a nice list that outlines all my twitter accounts and how active each one is with the number of tweets made in 2014. One of my life goals: To help people not just consume, but to create. 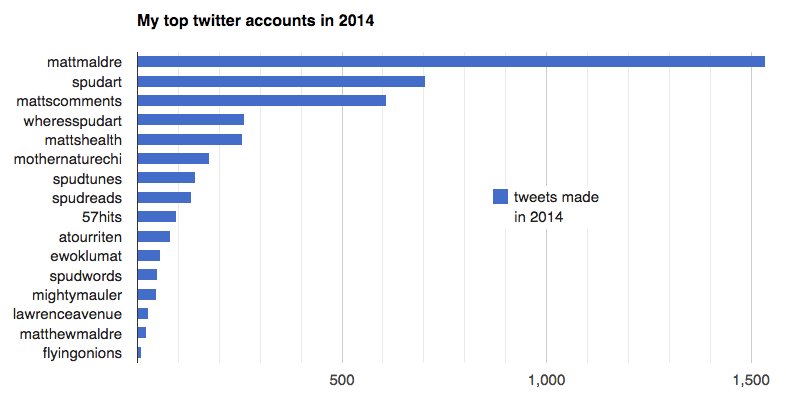 Across my 15 Twitter accounts, I made 4,205 tweets in 2014. I only have the one Twitter account: @lthanlon. I have to admit that I haven’t really posted all that much on it. I had briefly toyed with the idea of having my WordPress blog posts be automatically tweeted, but after accidentally tweeting news about a personal project to my entire list of Twitter followers, I abandoned that idea. What’s your opinion on Twitter and blogs? Is it a good idea to tweet blog posts? It’s a great idea to tweet blog posts, as long as you balance out the link-tweets with regular tweets. If your twitter account is all links to your blog, people might grow tired of that. But to mix in blog links in your tweets gives a nice value to your followers. I really enjoy when my friends tweet their blog posts, because sometimes I’m late on checking their RSS feeds in Feedly.